Newsies meets The Jungle in an all-new stand-alone novel from the author of Article 5 and The Glass Arrow Best friends Colin and Ty live one day at a time--the only way it's possible to survive in Metaltown, where money is in short supply, illness runs rampant, and street rules are the highest law. 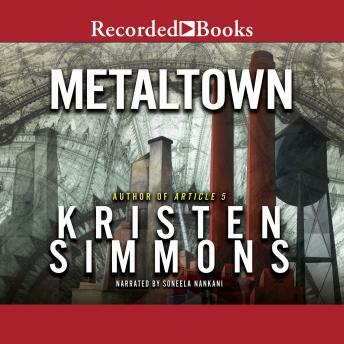 With the other near-starving teenagers of Metaltown, they work long, grueling hours for pennies at the Small Parts factory, attaching fuses to bombs and manufacturing weapons. When they're worked to the bone, they seek shelter where they can find it, and do it all again the next day. Meanwhile, in the wealthy River District across town, Lena Hampton spends her days learning useless ancient languages and the art of being a lady.all the while secretly studying the ins and outs of Hampton Industries, dreaming that one day her father will take her seriously and she'll become the first woman to run the family's expansive network of factories and businesses. Colin's, Ty's, and Lena's paths intersect when Ty is injured on the job and Lena, desperate to prove herself, fires her. In one morning, their dreams of a better future disappear, and Colin and Ty must find a way to transform their own lives--and Lena's--into ones that matter.